Is it even necessary to go over the background? I will quickly go over the background. Back in 2014, there was mounting concern that baseball no longer featured enough offense. Pitching had taken over, and we saw run-scoring plummet. Strikeouts, as you know, have only continued to go up over time, but that’s been countered by a sudden spike in home runs. There were 723 more home runs in 2015 than there were in 2014. There were 701 more home runs in 2016 than there were in 2015. There were 495 more home runs in 2017 than there were in 2016. Compared to 2014, the number of home runs hit in 2017 was up by a staggering 46%. That’s what baseball became — a showcase for the three true outcomes. Strikeouts and homers were in. The surge in power made some people happy. It made other people sad. The remaining people were indifferent observers of a changing game. No matter your opinion, we were all left to wonder: now what? Would the power surge continue? Would the ball continue to fly? Would more and more batters continue to swing up, enthusiastically trading contact for dingers? It’s easy to observe a trend that’s already in the books. It’s more difficult to know where it’s going. Most of the time, anyway. And in this case, I’ve given it away with the headline. What’s become of the home-run spike in 2018? There’s been, to be sure, no shortage of dingers. But the home-run count isn’t going up. It’s actually taken a step backward. Whether it’s signal or whether it’s noise, the home-run spike isn’t spiking. Strikeouts have gone up almost a percentage point. That’s unsurprising — the strikeout trend continues unabated. Walks have hardly budged. Offense overall is slightly down, as reflected by wOBA. We have seen a slight shift toward hitting more fly balls. And yet, consider those fly balls. 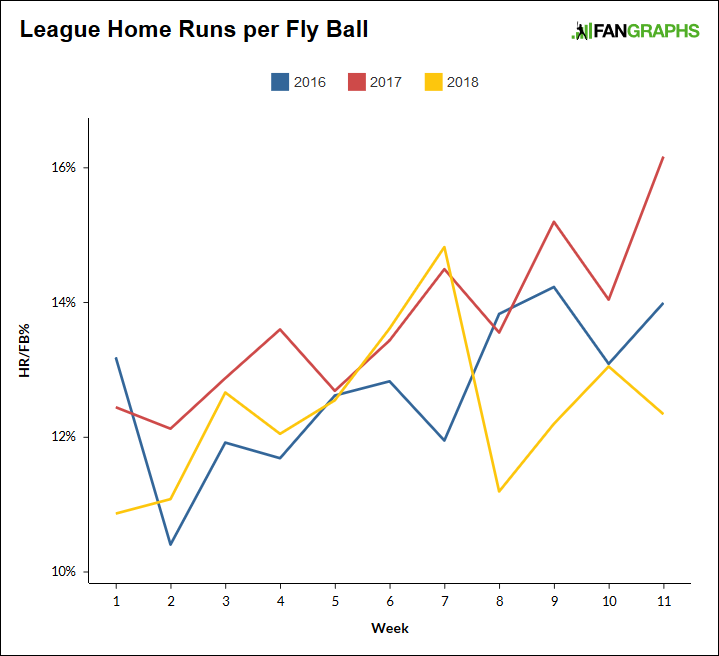 The rate of homers per fly ball has come back down a full percentage point. The rate of homers per batted ball has also, of course, come back down somewhat. It’s not like the league is back to its 2014 level. But it’s also not particularly close to its recent 2017 level, standing closer to 2016 instead. Perhaps, in time, when it comes to the home-run surge, we’ll see 2017 as the apex. It’s too early to arrive at such a sweeping conclusion, but it’s something to pay attention to. You can see things shifting downward. Whenever you reduce sample sizes, you increase the relative influence of noise, so on the week-to-week level, numbers bounce around. Still, we can say that more balls are being hit in the air. This is a trend with a variety of causes. And it’s hard to blame hitters, considering how fly balls have been rewarded. Earlier this season, there were a lot of cancellations, and there was a lot of cold, inclement weather. 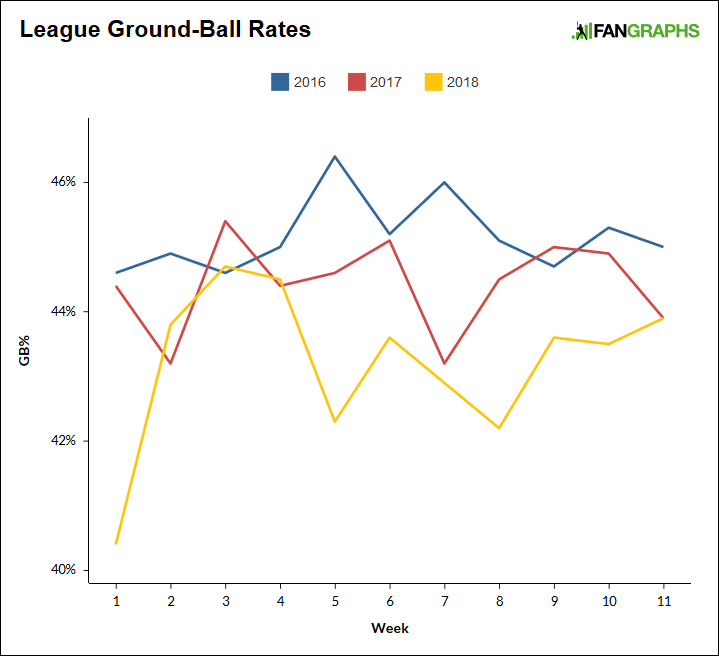 That seemed to me like a reasonable explanation for why the early numbers were where they were, and as you can see, by week five or so, the home runs reappeared. For a few weeks, you can see the 2017 and 2018 lines mirror one another. But then there’s another observable separation. 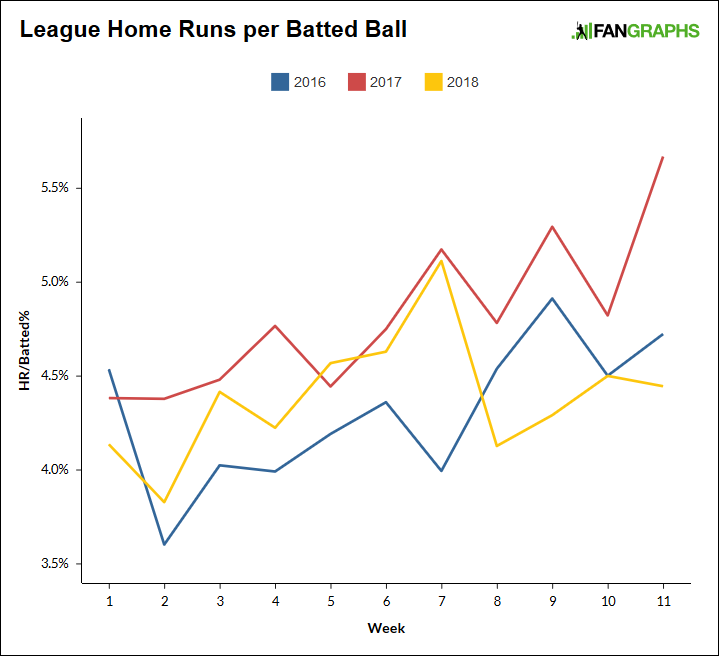 Over the past month, home runs have slipped well behind the 2017 pace. They’re even a little behind the 2016 pace. The home run is very much still alive in the game today, but something has reeled the trend back in. As it happens, I’m not the first person to get to this. You probably heard about MLB’s scientific committee that investigated the properties of the baseball itself. That committee included one Jim Albert, and Albert has already written on the early numbers in the 2018 season. Here’s an analysis post from May 28, and here’s another from June 4. Albert makes use of some of the available Statcast information, and of particular note is that launch angles and exit velocities are up. If anything, we’d expect there to be *more* home runs, since hitters seem to be hitting the ball a little harder and a little higher. Clearly, that’s not what’s happening. And in the second post linked, Albert folds in the potential influence of lower temperatures. Temperature explains a part of this, but not nearly the whole. There is clearly a decrease in home run hitting in 2018 and balls hit with specific launch angles and launch speeds are less likely to be home runs. As I noticed, 2018 hitters are actually hitting with higher launch angles and higher launch speeds, but the balls appear to have more drag. Of course, the big question is why this is happening, and this motivates further exploration. By using a new model using three variables (including temperature), I find that the 2018 home run still is about 300 behind what one would expect based on the 2017 history. So temperature explains some, but not all of the drop in the 2018 home runs. Home runs are down. That much we know. They’re not down by a dramatic amount, and it’s possible, as a fan, you hadn’t even noticed. It’s not like hitting for power is in any way endangered. Still, consider what the scientific committee found. In their collective judgment, home runs took off because the baseballs themselves experienced lesser drag. They didn’t have a definite answer for why that would be. Now, the early numbers suggest something has changed again. It seems as if the balls must be encountering more drag, relative to 2017, which only makes things all the more confusing. Plenty more analysis will have to be done, and I doubt I’ll be the one doing it. For now, know the baseball itself just continues to fascinate, with minor changes leading to broad repercussions. We hoped you liked reading Something Has Paused the Home-Run Spike by Jeff Sullivan! Home runs may be down slightly, but strikeouts are still way up, on a continuing trajectory to who knows where. That, and not pace of play, is the game’s most pressing and serious problem. For years I’ve been arguing in favor of a 10/10 rule, where teams can have only 10 players on the roster eligible to pitch — with an exception made if the score gets lopsided (10 runs up or 10 runs down), in which case they can send someone else to the mound. This simple rule change would force all pitchers, starters and relievers, to face more batters — which means conserving their energy, managing their arm strength, potentially leading to more balls in play and more action for the fans. Do you like this idea? If not, let me know what’s wrong with it. What happens after game four of a five-game stretch when your starter only lasts three innings and all five of your relievers went over the last two days? Your rule is begging for guys to get hurt. A) If all five of your relievers have been used in the past two days, you might want to bring up a fresh pitcher from the minors before the next game. B) Injury to pitchers can result from throwing too hard as much as from throwing too often. The point here is that pitchers will have to learn to pace themselves again instead of going all out all the time. I agree with what qacm said about using minor leaguers, and also with the general idea that a strengthened focus on pacing and managing arms would make these difficult situations less frequent. Also, such a system would bring value to the “innings eater” type, which, in my opinion, is a skill worth rewarding. Is 10/10 the perfect number? Idk. But I think a rule in the same spirit is worthy of discussion. Look on the bright side: at least you didn’t have to face the Ohtanis. It wouldn’t do anything. When you account for the starting pitchers on the roster who no-way-no-how-never are going to pitch in a day’s game anyway you’re left with today’s starter, tomorrow’s starter, and 7-8 relievers. what does that even accomplish? Unless you’re talking about a 25-man roster restriction. i.e. 15 batters and 10 pitchers by rule. And in that case, the MLBPA would never agree to it, because that’s going to put an awful lot of voting members out of work. We have no data to prove this would reduce strikeouts. We have no data to know how this would impact injuries. There has never been the need from a rule book perspective to define a roster position. There might not be any need to change the rules. There might be other ways to address the strikeout issue. I don’t like the “we have to do something why not this” approach either because the law of unintended consequences always raises its ugly head. Do I think it’s the best idea? Certainly not, and I agree with Gavin’s injury concerns. But qacm brought up a reasonable point and was looking to discuss with others about it. There’s nothing wrong with that, and it deserves more than a simple thumbs down on his comment. The downvotes are the feedback.